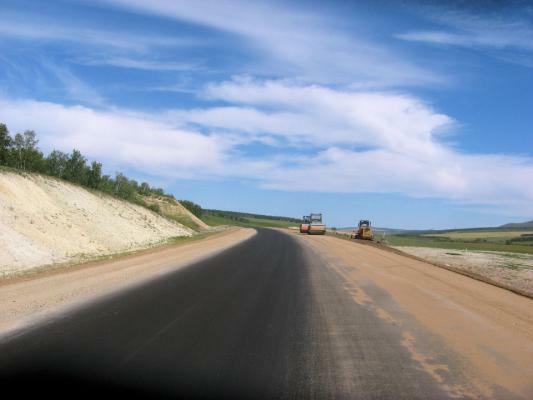 They are building a new road from Chita to Khabarovsk. It was the announcement of the “opening” of this road in 2004 that sparked the idea for this ride. Today we saw some of the new road and even cycled across fresh tar as they were busy paving. 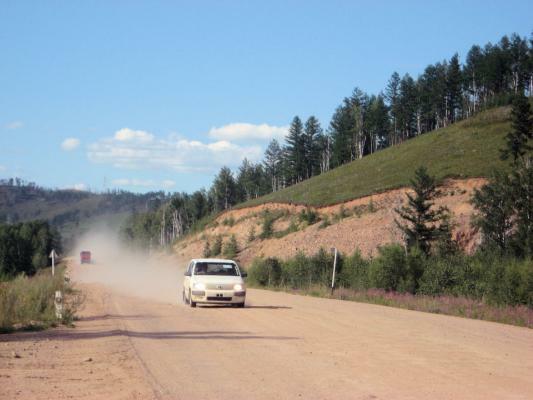 It total 24km of gravel and 72km of asphalt. (I put “opening” in quotes since the road is far from complete and because there were already ways to get through some years before 2004). We awoke a little before sunrise and were quickly on the road. The road this morning had a smooth surface. It was so smooth that I started to wonder after 12km if we had transitioned to a very poorly surfaced asphalt road. Yesterday we had multiple conflicting reports of exactly when the asphalt might start. However, at 17km we had our answer when we reached kilometer post 277. Wow, pavement! It was a welcome and sudden change. The smooth road went past agricultural areas with hay fields, wheat and cows. It also went across some gradual ups and downs with a big drop at 24km followed by a 3km climb at 26km. 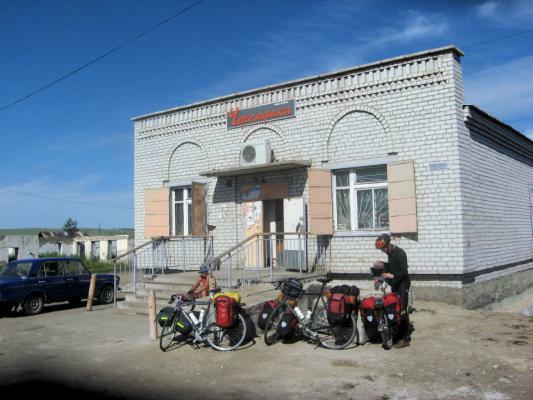 This all made for a quick ride and our first cafe stop in Чернышевск. After lunch we cycled through town with stops at a store. Leaving town we had 3km of gravel before reaching the new road. The new road was wide and smooth. It was freshly paved (15km later they were still busy paving the second layer of asphalt) and was not yet striped. The grades were gradual though it climbed several hills. At 72km we got stripes. 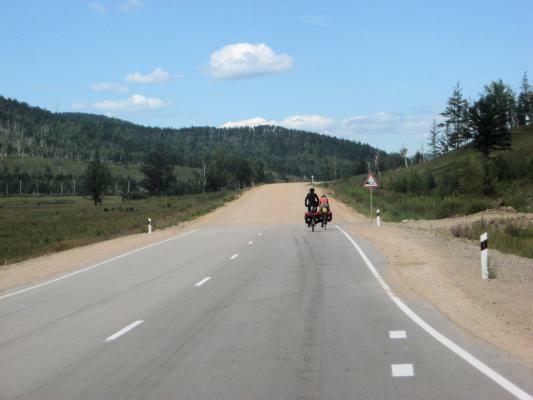 We made good progress to Жирекен at 92km. Here we stopped at a second cafe for the day. This was also where the road changed back to gravel. We rode 4km of the new dusty road before stopping for the day. Nice to have a break from the gravel roads today.